To read it click on the diary & blog link on the left or click here. 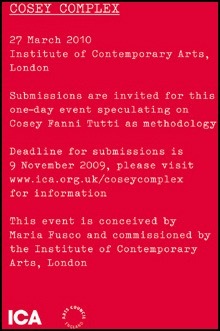 Cosey is taking a holiday break until the first week of January 2010.
this short symposium explores in greater depth some of the issues raised by our current exhibition Pop Life: Art in a Material World. We extend the discussion to the relationships between art and business and explore artists' strategies and the status of the work of art in an age of mass production. Speakers include Iain Robertson, deputy academic director and head of art business studies at Sotheby's Institute of Art, Cosey Fanni Tutti, artist,Catherine Wood, Tate Modern, curator of Pop Life: Art in a Material World, Jaime Stapleton, associate research fellow of the School of Law, Birkbeck College, University of London, and Marek Claassen, director of Artfacts. These speakers will approach the complex interactions between artists and commerce in contemporary life from a range of critical perspectives. on Thursday 1st October until 17th January 2010. National Gallery of Canada, Ottawa from 11 June – 19 September 2010. Please be aware that some works in this exhibition are of a sexual nature which some may find challenging. Admission to two of the rooms is restricted to over 18s only. on Cosey Fanni Tutti as methodology entitled 'COSEY COMPLEX' at the ICA, London on March 27th 2010. The event was conceived by Maria Fusco and commissioned by the I.C.A..
Maria and the I.C.A. are inviting open submissions to be included as part of the day the deadline for submissions is 9th November 2009. Please visit the Institute of Contemporary Arts web site for more details on how to participate in this unique event. Chris Carter has posted photos and a video clip from Cosey's recent COH plays COSEY performance at the Brussels Electronic Music Festival on his Flikr pages. Chris Carter has posted some of his personal collection of fetish photos of Cosey on his Flikr pages. Please note that due to the nature of these images an age verified Flkr account is required to view them. Just to let you all know that Cosey is now on Twitter. twitter.com/coseyfannitutti and in the sidebar on the right side of this page. Cosey Fanni Tutti and Ivan Pavlov will be performing live together for the first time on March 22nd in Brussels, Belgium.